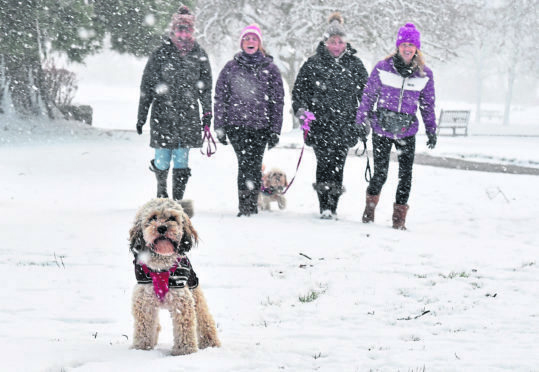 Dogs and their owners enjoy the snow in Aberdeen's Hazelhead park. Forecasters have warned that the first blast of snow this winter could hit the north and north-east of Scotland next week. Councils across the region are already preparing for freezing conditions with gritters out working on the roads. Temperatures have recently plunged overnight with the coldest of the autumn season in the UK so far being recorded in Aboyne, in Aberdeenshire, on October 7 at -4.3C. Alex Birkhall, meteorologist at the Met Office, said: “There is a risk of snow at some point next week, it is certainly not out of the question to see snow before the end of October. “High pressure winds from the UK will have a larger impact further north, and snow at higher grounds in particular is a definite possibility. The autumn season in the UK officially begins at the start of September and ends in November. Mr Birkhall added: “Sheltered towns and villages are likely to be more cold – and nights in Aberdeen and Aberdeenshire will likely be around -2C, or -3C for a while. The Met Office said it was too early to predict whether the winter would rival the severe cold snap which hit the UK earlier this year. Councils have already started preparing for the colder conditions. An Aberdeen City Council spokeswoman said: “Our early morning and standby gritting operations start from 16 November until 20 March or later should winter conditions continue, and we provide a 24/7 service during severe weather conditions.